Currently the city of Bridgeport, Connecticut is looking at building an anaerobic digester to treat its sludge. This is a much less polluting technology that GNHWPCA should also be considering. Finally, after years of delay the GNHWPCA meets with NHEJN November 16, 2011. In January 2009 we asked them to fix the flaws in the Biosolids Study (see below); they said they had an internal document. We asked them to report the findings of the revised study to the community; we’ve never seen it. They don’t have any plans to phase out the outside sludge contracts. They don’t have any plans to find alternatives to sludge incineration apart from the CH2MHill report that is flawed. They do plan to decide within this year what to do about renewing the current contracts with Synagro to incinerate sludge in New Haven both ours (22 tons/day) and that from outside our region (18 tons/day). Current 20 yr contracts expire in 2014. They might be able to tell us how much revenue Synagro receives for burning all outside sludge in New Haven. They have a contractual agreement with Synagro that allows Synagro to incinerate sludge in New Haven. Synagro/GNHWPCA are required to tell the state how much pollution is produced but not how much money Synagro makes hauling sludge into New Haven and incinerating it here. 2005- New Haven Board of Alderman unanimously pass a non-binding resolution calling for the GNHWPCA to terminate all interlocal sludge agreements when they expire, enter into no new sludge incineration agreements, phase out all incineration of sludge form the constituent municipalities by 2015 and replace the incinerator with advanced technology. 2006: GNHWPCA hires a new executive director, Dominic DiGangi. He states that he has no interest in phasing out the sludge contracts. The Board of Aldermen asks him to tell them about his plans for the future of sludge incineration at GNHWPCA. In response Mr. DiGangi and the GNHWPCA Board of Directors hire CH2MHill to do a study of alternatives to sludge incineration and make recommendations to the community and to the GNHWPCA about the best way to proceed in the future. They released their report in April 2007. It became final in April 2008. See links to New Haven Independent coverage of this time. 2008: NHEJN asks the Yale Environmental Protection Clinic to evaluate this report. After voluminous gathering of documents and interviews they released their report, “An Analysis of Flaws in the CH2MHill Report Biosolids Evaluation”. NHEJN presented this report to the GNHWPCA’s Board of Directors in January 2009 at their monthly meeting and asked them (and they agreed) to respond within 60 days to our request that they correct the flaws, report the result to the New Haven Board of Aldermen and the community through a press release and inform the community through a well-publicized public meeting. Does not address pollutants from the smokestack and does not factor into conclusions. Criteria for evaluation defined solely by CH2M and GNHWPCA without public input. Initial draft called for public input, final report deleted public input. Weighing criteria does not allow for relative importance. Incorporates costs into evaluation of benefits wrongly penalizing alternatives. Double counts energy recovery giving advantage to incineration. Measuring performance of alternatives was not transparent, impossible to evaluate. Scoring of alternatives not transparent and highly questionable on their face. Use erroneous figure for average amount of regional sludge incinerated undermining subsequent calculations. Overestimates by 100% the revenue that GNHWPCA receives from Synagro in exchange for processing non-regional sludge at the incinerator. Overestimates the revenue from the status quo over 20 yr period and dramatically inflates the final benefit/cost score assigned to the status quo. Overestimates the amount of sludge that will be processed under the status quo. The use of this inflated estimate leads to a number of significant mistakes in the report. By overestimating the amount of sludge to be treated at the incinerator it underestimates the amount of non-regional sludge that will be processed leading the report to account for only 56 % of the truck traffic and emissions that the status quo will entail. Estimated number of truck deliveries under the status quo do not match the CHNWPCA records thereby underestimating the reduction in traffic and truck emissions that would result from ending non-regional sludge incineration. 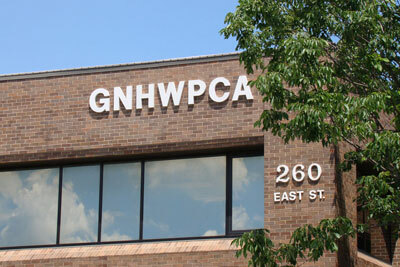 Apart from a few telephone calls from a new employee of the GNHWPCA no further communication has occurred until September 2011 when we sent a letter to the GNHWPCA Board, Chief Executive Officer and New Haven Board of Aldermen requesting that they address our concerns. Sidney Holbrook, executive director of the GNHWPCA, called and requested a meeting. The Pollution Within by David Ewing Duncan: a description of chemicals within our bodies, our “body burden”, 2006. Linking atmospheric mercury to fish advisories by Rebecca Renner, Aug 23,2006 in Environmental Science and Technology. The sewage sludge incinerator is the main source of mercury emissions in our community. What’s in biosolids? It’s just beginning to be studied but basically it’s almost everything that goes down the drain. Chad Kinney continues research into biosolids, cleaning pollutants through vermiculture. Wasteland, A Journey through the American cloaca by Frederick Kaufman, Harper’s magazine, February 2008, 46-59. about Synagro, the company that runs the incineration business in New Haven.